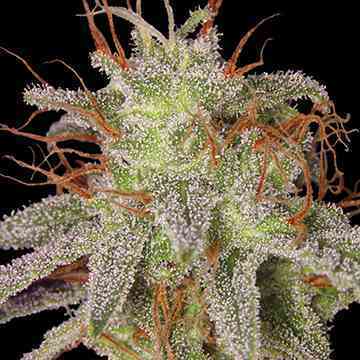 Critical is a devastating fast growing Indica. It matures between the 45th - 55th day of flowering growing indoors, outdoors it is ready by the end of September but be aware to check the plants for mold, if the weather gets too wet. This strain has become famous for various reasons. First of all, the yield is mind blowing, branches are bending in the end of the flowering cycle. Then the intense sweet fruity flavor that fills every room with its pungent skunk odor. Our feminized version of Critical also carries the super-producer ability of her ancestors. These plants grow very fast and have the tendency for strong side branching, we therefore recommend to control the height before introducing them to flowering. Critical is praised as one of the top commercial strains because there is hardly any type of cannabis on the market that can compete with its super heavy yields and the extremely short flowering times. It won the 1st High Life cup in Barcelona. Very easy to plant and grow. In less than 4 days changes are seen. Excellent purchase, I will repeat.